Odidiva - The African Queen, has been invited to the prestigious New York City art fair, Performa'17. 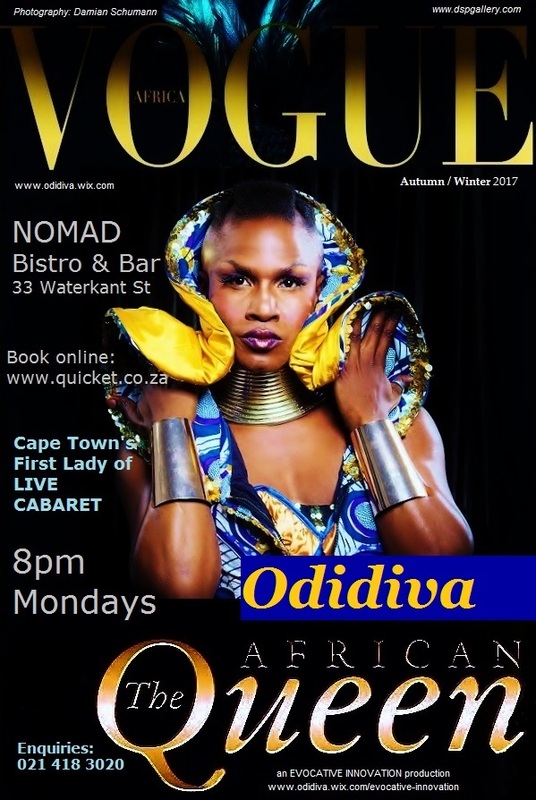 Also known as Odidi Mfenyana this Cape Town based Performance Artist, named among the world's top live singing Drag Performers by the book Around The World In 80 Drag Queens, will be supporting, friend and colleague, Zanele Muholi, "Africa's most powerful female artist" - Art Review magazine. In a trailblazing career starting in 2001 as the showstopper in award-winning South African theatre director, Brett Bailey's BIG DADA - The Rise and Fall of Idi Amin, Odidiva has taken the art of drag from the underground club counterculture to the mainstream of the arts, crossing genres, transforming African Queer culture by influencing hearts and minds. Odidiva likes to brag about being the “only live act black drag queen in Cape Town”. That translates as: no lip-synching, no impersonation – everything is live, proud and personal. But what really distinguishes her is her political edge. She likes to be compared to Evita Bezuidenhout in that regard, but Odidiva is a guerrilla fighter in comparison. She’ll have you up an’ dancing to Brenda Fassie’s Weekend Special and while you’re still pulling in your chair, punch you in the stomach with something like: “If we don’t invest in education now, we are still going to be robbed at gunpoint in 20 years time.” Which will only have you laughing even louder at her next quip about christening Jacob Zuma as “President Lovepants”. 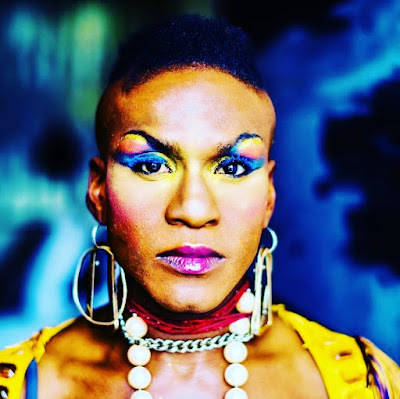 Like Zanele Muholi, Odidiva is a LGBTI activist artist using the performing arts as a platformto inspire social cohesion as encouraged by South Africa's world leading Constitution godfathered by legendary statesman Nelson Rholihlala Mandela and spiritual icon Archbishop Desmond Mpilo Tutu. Now in her 16 year, Odidi Mfenyana's nom de guerre Odidiva is looking to growing and mentoring the next generation of African Queer Activist Artists with BUSHWAACKING, her self coined version of US invented Voguing/Waacking which forms the basis of Mfenyana's Master in Fine Arts thesis at AFDA on route to establishing the African Queen Queer Arts Institute. Please tune into The Salon Bush Radio 89.5FM tonight 20h00 Wednesday 4 October 2017 for a full interview with Odidiva. 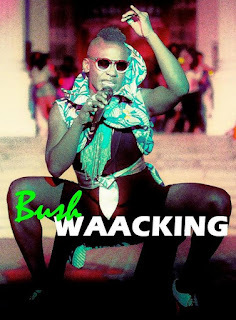 Here more about her life and times and get the fierce "gees" that's bringing life to South Africa's queer arts culture. "Welcome home Qawe lama Qawekazi (Hero of Heroines)". In the three years since we last connected working together our lives have experienced exhilerating highs and life threatening lows. In the face of so much death, destruction and civil upheaval in the world over the last 3 years, we cannot think our strife is significant. If anything we as human beings should be embracing our kinship. deep in a war of worlds, so unconventional it beguile old methods of perception and requires us to reach for reinvention. For one to turn the corner on one's doldrums one must believe in the faith of life. The blessings of abundance include the good and the bad. For if life is for the living when it is painted in the light and shade of contrast; the juxtaposition of contradiction of the human condition. "We have Faith in Poison. We Will Live Our Lives Completely EVERYDAY…"
In eye of the cyclone one sees with that the ferocity of the tempest will temper how we distinguish ourselves. 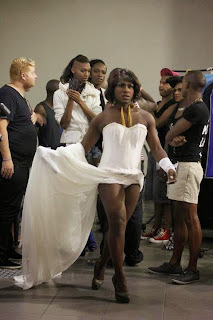 ibuphilayo.KwaXhosa kuthiwa into engapheliyo iyahlola.Kuzo zonkeizinto ezinesiqalo neziphilayo akukho nanye kuzo eya kusiphephasiphepheke ngokupheleleyo isiphelo. Zonke ke izinto ezikhoyozithambekela esiphelweni zithanda zingathandi"
All things that have a beginning must appropriately have an end, like every that lives over time will lose the life it lives. "What does not end becomes grotesque"
Sadly, the hegemony of power in the previous century, is still in denial; convulsed in the most grotesque death throes. Reinvention requires ones ability to dig deep into the mines of one's body and soul. This is by no means a frivolous task but industrious action meant to reinforce one's "gees". That "joie d' vivre" needs to be buttressed by emotional titanium. The ability to invest in introspection, meditation and intellectual jousting for emotional intelligence strengthens one's ductility. Hence the universal rituals of spiritual sabbatical, fasting for feeding the soul, meditation through incantation, until body, mind and soul is imbibing divinity. 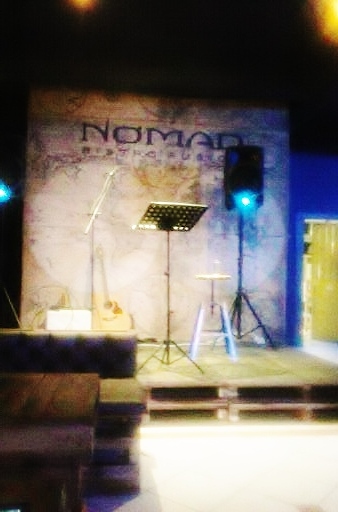 “The creative arts play a significant role in igniting moments of pause in one's life that lead us to question more. Therefore the undeniable imperative of creativity as a catalyst for socialinnovation is required in the same way gold is considered a safe asset in times of crisis. For too long contemporary artists have been overexposed to being commoditized; that this essence is endangered. It then makes it logical to understand my need to celebrate an African artist, a contemporary, a mentor, patron and friend who has recaptured and rejuvenated this zeal to the world's attention, respect and acclaim. Many of us in South Africa still do not realise the psychological trauma in the blackout of African excellence from our lives. 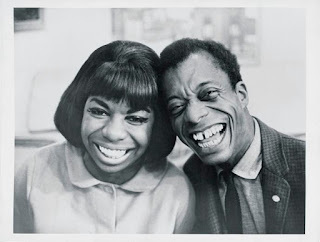 As an African Gay man of 23, I discovered that the writer I'd often heard named amongst America's top 10 literary authors, James Baldwin was not only not a white man, but African-American and gay too! I promptly picked up "Giovanni's Room" and in the forward discovered a revolutionanary social catalyst for societal transformation. How radical? No life changing. Giovanni's Room is a story of two Caucasian gay men falling in love in and out of love in Paris was published in 1956. James Baldwin along with another revolutionary artist, Nina Simone best friend of exiled Miriam Makeba were banned in South Africa until repeal of the laws were repealed in mid to late 90's . Meaning accessing the work from their glory days trickled in around 2001 and due mostly to internet access. 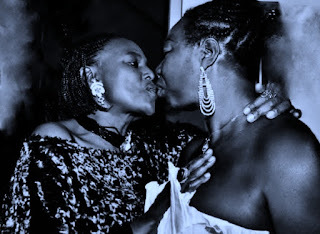 South Africans watch with hostile envy and bewilderment as six decades long emancipated Africans enjoying cultural bonds, win Big Brother Africa. Even with knowledge of Aparheid's deliberate seperation of us from our brethren , we have internalised the narrative propagated by our White Supremecist oppressors. Forgetting the very media company broadcasting from our Johannesburg was the propaganda arm of the Afrikaner Nationalists that oppressed us. So we carry on listening to mostly American and British as cleverly prescribed by the Apartheid regime. 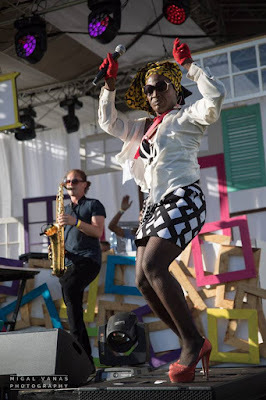 SAMRO (South African Music Rights Organisation) pays out almost 80 percent to its Western counterparts. While we are impervious imperious in our superiority floundering believing and behaving wrongly. Xenophobia flags our debilitating symptoms from of what I will call Post Apartheid Traumatic Stress Syndrome. "Power corrupts the few, while weakness corrupts the many. The resentment of the weak does not spring from any injustice done to them but the sense of their inadequacy and impotence. They hate not wickedness but weakness. When it is in their power to do so, the weak destroy weakness where ever they see it." This is evidenced in the proliferation of the serial pathology of violence against women and children in this nation of ours eMzantsi Afrika. We have opportunity to embrace ourselves this women's month. The opportunity to grab, hug and kiss our self-esteem. The Guest of Honour works tirelessly as a catalyst for social innovation. The COMEBACK - Guest of Honour Zanele Muholi is a timely, consciously deliberate expression of love, pride, and activism. A rebuttal of all afro-pessimism wracking our society's inferiority complex, lashing out, self-mutilating with homicidal brutality. We close this Women's Month with a graceful "klapback" at the ideologies that favour dominance and oppression, vanity and grandiosity. 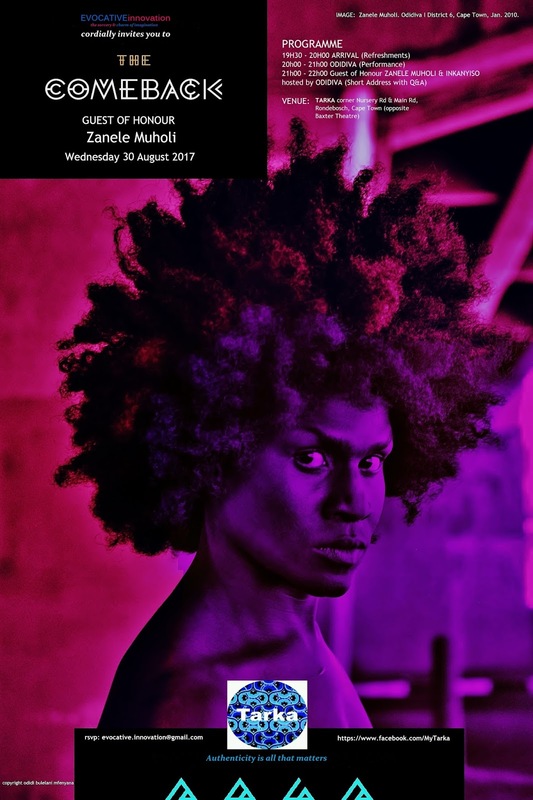 This on the eve of Zanele Muholi's first exhibition in Cape Town since 2012. 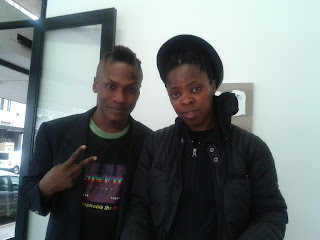 Another icon to African excellence, a crucial salve inthe sorcery of imagination that will one day help heal the nation. The exhibition is on view until 7 October 2017. 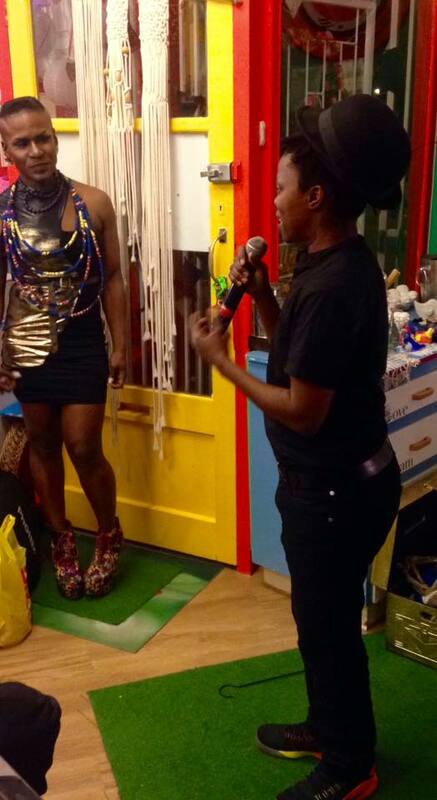 "God grant me the serenity to accept the things I cannot change, the courage to change the things I can and the wisdom to know the difference"
is one of Cape Town's most recognisable drag performers, specialising in Live Singing, Stand-up Comedy and Slam Poetry.Odidiva first debuted in Brett Bailey's BIG DADA: The Rise and Fall of Idi Amin in 2001 and has since become the star of electronic dance theatre show HOUSE OF THE HOLY AFRO which has toured to over 15 international cities since 2004. 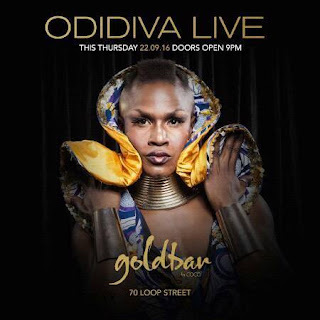 Odidiva is Cape Town's First Lady of Live Singing Drag. A trailblazer who helped put popular burger franchise Beefcakes (2009 - 2013) on the map with features in international magazines and blogs (OUT Traveller Magazine USA, Gayographger - GayAtlas.com). 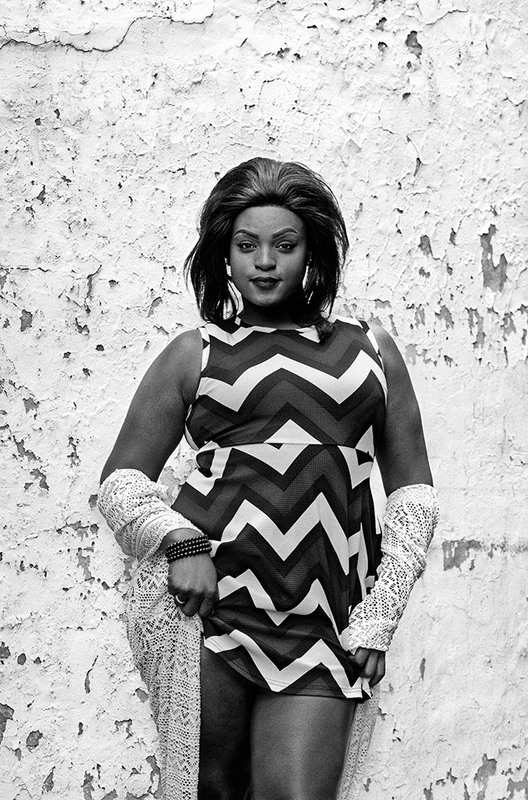 So revered is Odidiva's international profile was invited to represent Africa in the book Around The World in 80 Drag Queens, the continents's sole representative. Around The World In 80days is published and available exclusively on Amazon.com . Odidiva contributes a short story and a cocktail in New York City drag blogger and celebrity entertainment journalist Jeza Belle's coffee table book; The Harlot's Guide to Classy Cocktails . The publication has received critical acclaim and awards at the New York Book Festival and the National Indie Excellence Awards. 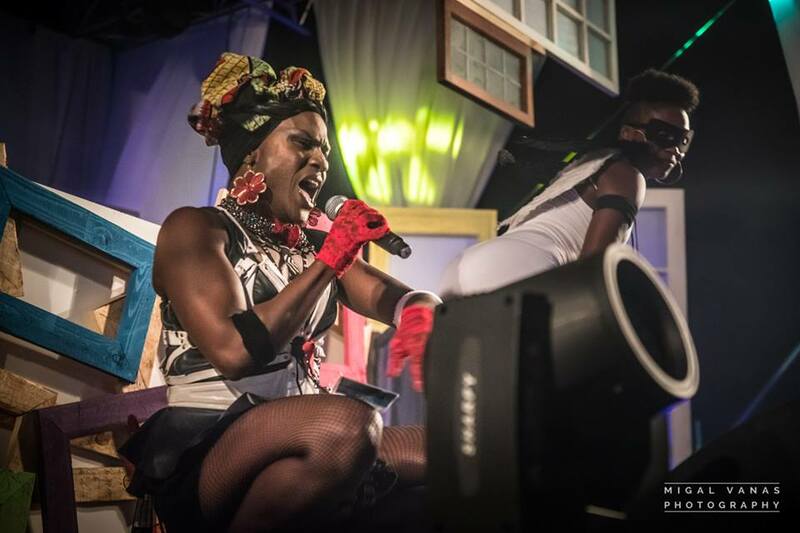 An in-demand MC with stage presence, eloquence and spicy comedic humour Odidiva is hosting Cape Town's new Battle of the Band contest, UPSTAGED (19, 28 April Grande Finale 3 May) at Nomad Bistro & Bar. 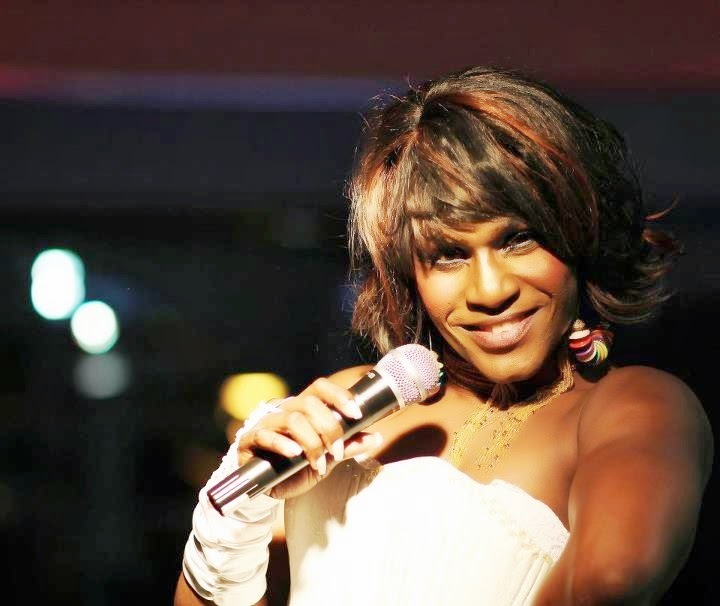 With more than 16 years in the entertainment industry Odidiva has hosted a number of private and public engagements including most recently the electronic dance music event, MTV Plus 1 Festival (17 - 19 February 2017) in Franschoek. Odidiva - The African Queen - Live Dinner Cabaret Show offers you the opportunity to experience the internationally popular and critically acclaimed talents of Odidiva in the warm, relaxed and hipster cool, live music venue, Nomad Bistro & Bar over Dinner and/or Drinks. ODIDIVA/ Odidi Mfenyana is an accomplished performing artist. FOR A FEW MOMENTS I THOUGHT I'D DIED AND GONE TO HEAVEN..."
to the heart of the Mother City. 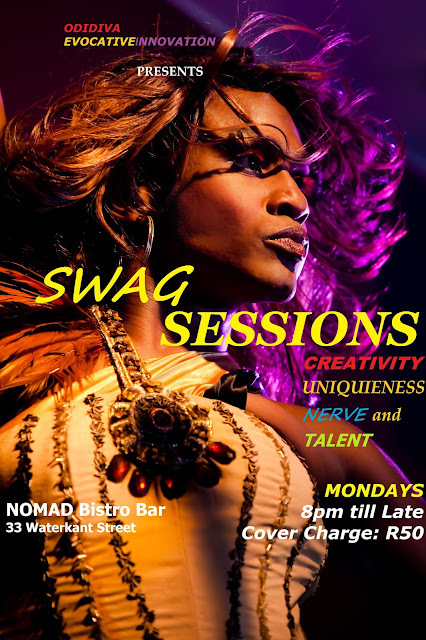 SWAG SESSIONS is slick, edgy, conceptual, popular, and fabulous; the way art ought to be every night. Transparent, a television series produced by Amazon.com, transforms how one views television by putting on TV, what most middle class people see as life turning moments into a fascinating study of a man and his family as he transitions into a woman in his twilight years. To say the script and the acting are exceptional is to restrain hyperbole. To say the direction and production value is above any revival, takes away from the simplicity, the superb care taken by the producers to let the characters immerse one in this extraordinary tale. I have never been so freaked out by the awkwardness of scenes in a drama to the point, I am behaving like I am watching a horror film, and turning the volume off. 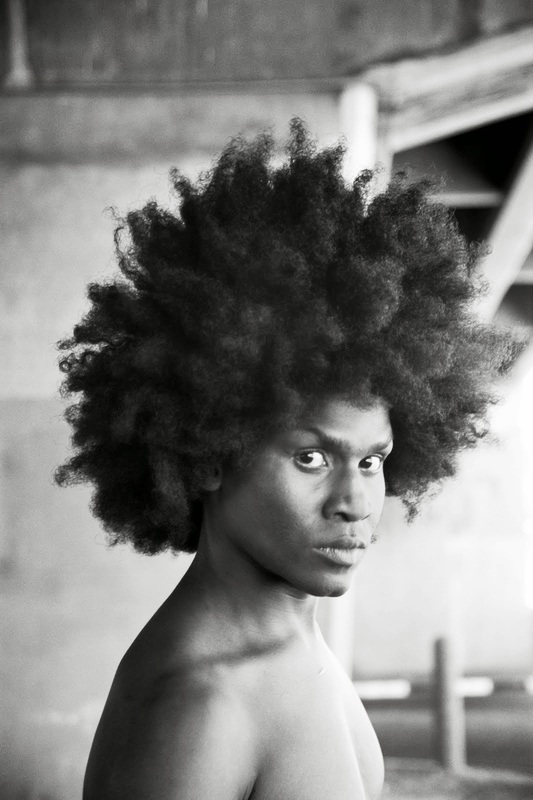 The subject matter in the series goes beyond just Trangender and will touch every cerebral adult whose ever struggled with a turning point: a life changing process. Never have I seen such careful restraint, boldness or originality in American cinema or television since HBO's Looking. Both set in California and washed with its brilliant white light and breathtaking landscape echoing Cape Town and the Western Cape. I would hate for this trailblazing gem to be diluted of its pungent divinity. Its supernatural how Transparent draws out from one all of life's emotions, from the depths of sorrow then ticking every box; ascending to euphoric happiness. The Amazon debut series does this with uncanny perfect timing and scintillating skillful finesse. The actors all have a deft touch of elevating their gifted script to believable reality. A masterclass in art imitating life. Its only cinematic contemporaries are Cape Town boy-wonder Oliver Hermanus's Skoonheid (2011), the award-winning Neil Jordan's The Crying Game(1992) and TransAmerica (2005) that gave Desperate Housewife Felicity Huffman a justified Oscar nomination. Transparent is a greedy feast an emotional smorgasbord of a television series. This is a collectors item for connoisseur's of American independent film and European Art-house Cinema. Amazon.com must be applauded for its courageous and ingenious foray into film and television production. I can only wait with an anticipation and baited breathe for what Amazon Studios has next for the world. Transparent is as intense as 2016. 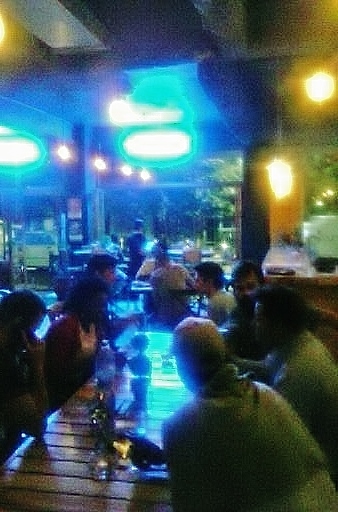 Odidi Mfenyana. Awesome Inc. theme. Theme images by sebastian-julian. Powered by Blogger.